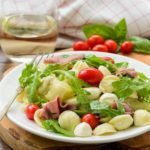 A recipe for a salad made with roast beef, pasta, mozzarella, tomatoes, artichoke hearts, fresh herbs, arugula, and a citrus dressing. Cook the pasta according to the package instructions. Drain. Add the bocconcini, artichoke hearts, tomatoes, basil, olive oil, lemon zest, and lemon juice to a large bowl. Stir or toss gently to combine. Season with salt and pepper. Add the cooked pasta, arugula, and roast beef to the bowl. Stir or toss gently to combine. Adjust seasoning if needed with additional salt and pepper. *Bocconcini is small fresh mozzarella balls. If those are not available, use larger fresh mozzarella and cut into bite-sized pieces.